Z. Alexander Looby was among the small cadre of African American lawyers who began practicing in the southern United States during the 1920s and 1930s. Often considered the “second generation of black attorneys,” these lawyers followed the first cadre of African Americans who began practicing in the 1880s. They also provided much of the legal work that led to the dismantling of segregation in the late 20th Century. Zephaniah Alexander Looby was born in Antigua, British West Indies in 1899 and immigrated to the United States in 1914 after the death of his father. He earned a B.A. degree from Howard University and a law degree from Columbia University. Looby came to Nashville, Tennessee in 1926 to work as an assistant professor of economics at Fisk University. Three years later he was admitted to the Tennessee bar and practiced in Memphis for three years. In 1934 he married Grafta Mosby, a Memphis schoolteacher. Around 1935 Looby returned to Nashville and helped found the Kent College for Law for African Americans. Looby entered politics in 1940 when he was narrowly defeated for a position on the Nashville City Council. Eleven years later in 1951, Looby was elected to the council along with fellow lawyer Robert E. Lillard. They were the first African Americans to serve on the council since 1911. From 1943 to 1945, Looby was president of the James C. Napier Bar Association, an organization of African American attorneys named for the prominent Nashville political activist. In 1946, he worked with the future U.S. Supreme Court Justice Thurgood Marshall on the National Association for the Advancement of Colored People (NAACP) sponsored defense of twenty-three African Americans who had been charged with murder following race riots in Columbia, Tennessee. All of the defendants were acquitted. Shortly after the 1954 Brown v. Board of Education ruling, Looby filed the first desegregation suit against the Nashville public schools. When the student sit-ins began in Nashville in 1960 he became their first attorney, an action that resulted in his home being dynamited later that year. Looby and his family were uninjured in the attack. 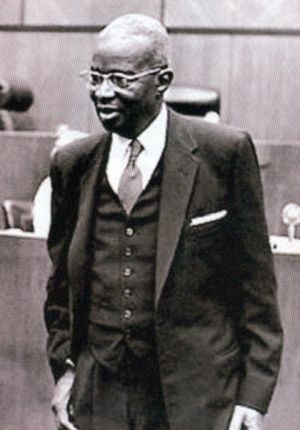 In 1962 Looby lost a bid to become the first African American elected to the Tennessee Supreme Court. Looby remained on the Nashville City Council for twenty years before retiring in 1971. Z. Alexander Looby died in Nashville in 1972. Looby’s life and works are commemorated by a Nashville library and community center named after him. Linda T. Wynn, “Zephaniah Alexander Looby” in The Encyclopedia of Tennessee History and Culture edited by Carroll Van West (Nashville: Rutledge Hill Press, 1998); John Egerton, Oral history interview with Adolpho A. Birch, June 22, 2005, housed at the Nashville Public Library, Nashville, Tennessee.